A a stupendous Polychrome Japanese Silk MARU OBI depicting Phoenix in flight, crashing Waves and Peacock feathers. Comes with a dowel and a magnificent gold painted/signed porcelain end and a golden tassel. Excellent condition. 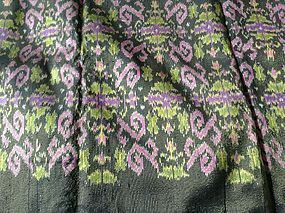 Size: 160" x 13" ( 400 cm. x 32 cm. ) 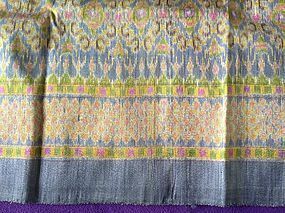 Can be used as a stunning hanging tapestry or as a central table runner. Superb Japanese Silk MARU OBI depicting Imperial 5-clawed Dragon amongst clouds, the Pearl. Included is a dowel and a magnificent gold painted/signed porcelain end and a golden tassel. Excellent condition. 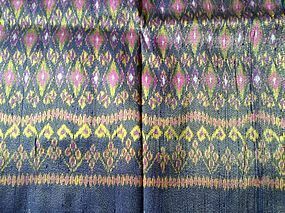 Size 400 cm. x 32 cm. 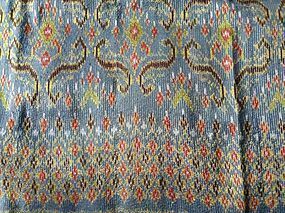 Can be used as a splendid hanging tapestry or as a central table runner. 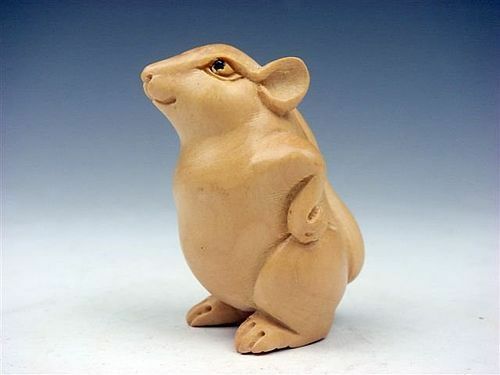 An expertly hand carved wooden NETSUKE JAPANESE MOUSE. Excellent condition. Size: 5.2 cm. 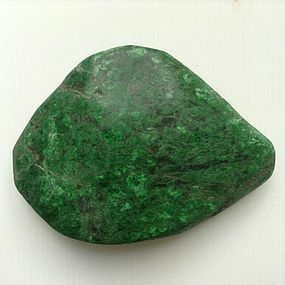 x 3.4 cm. Very fine details and has 2 small holes at the bottom for stinging. 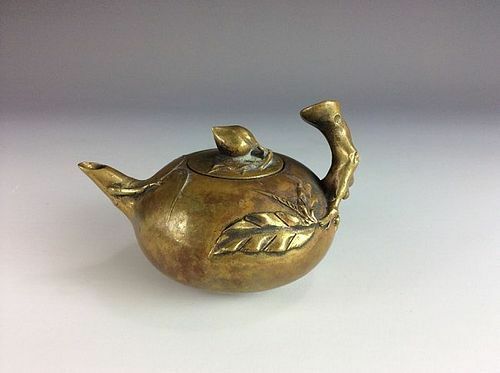 A fine Chinese Bronze Teapot beautifully ornamented with leaves/foliage. The cover has a lotus bud finial and the handle is crafted as a natural branch. A fine collector's piece. 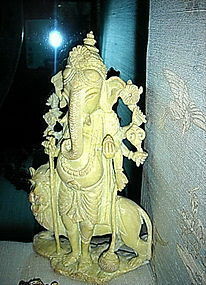 A magnificent SERPENTINE GANESHA - GANESH Carving with Majestic Singha LION. Finest workmanship. Excellent condition, no damage or restoration whatsoever. Size: H. 20 cm. x W. 12 cm. x D. 4 cm. (8" x 4.75" x 1.5"). 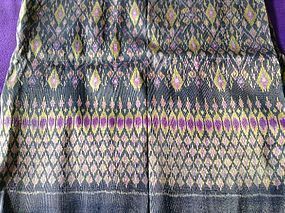 Very rare 100% SILK IKAT (Matmee) with Gold-Brocade thread interwoven from Thailand. Hand woven, very tedious and time consuming work. Excellent condition. 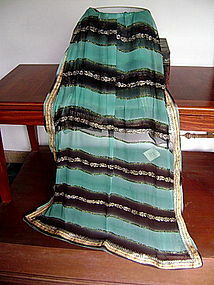 Size: L. 68" x W. 40" (172 cm. x 102 cm.). 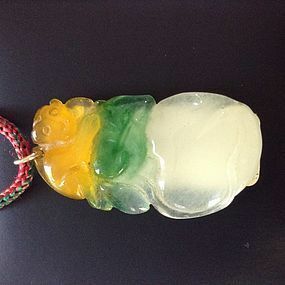 A rare and attractive Burmese Jadeite 3-tone carved Pendant (Yellow, Apple Green and White) depicting a monkey on top and fruit. Fine workmanship, good translucency and well polished. Size H.4.5 cm. x W. 2 cm. Good condition, has a small hole on top for hanging. Difficult to find! 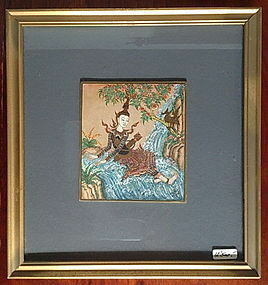 Original hand painted Thai Miniature Painting on slab of bone depicting a Thai Angel figure from the famed Ramayana. Size: Framed 22 cm x 21 cm; unframed: 10 cm x 8.5 cm. Signed. Shipping cost extra. 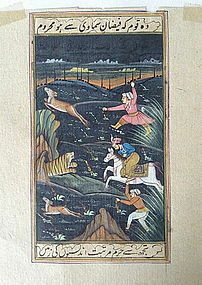 Vivid Mughal Miniature Painting on Manuscript Leaf depicting hunting scene. Good condition. 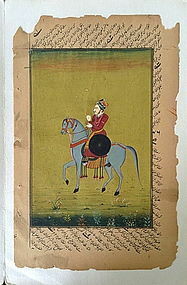 Size: H. 7.5" x W. 5.5"
Attractive Mughal Miniature Painting on Manuscript Leaf depicting a Nobleman on his Horse. Good condition. 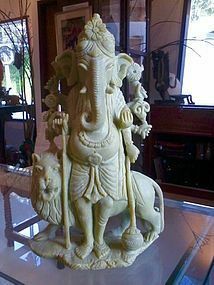 Size: H. 9.5" x W. 6"
Magnificent Serpentine hand carved GANESH and Singha Lion Figure. Very good condition, no damage or repair whatsoever. Size: H. 20 cm. x W. 12 cm. x D. 4 cm. Very fine workmanship indeed. 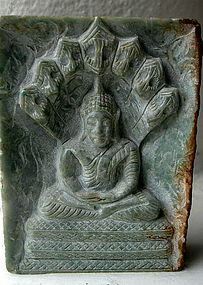 A finely hand carved Buddha Image in deep meditation pose of solid Burmese Jadeite. Condition: very good, size: H. 9 cm. x W. 6.5 cm x D. 2.5 cm.